Coupons, coupons, and more coupons, from our garage door company to you! We know that you’re not made of money, but that doesn’t mean you shouldn’t take advantage of our garage door services. We know that garage door services can be on the pricey side. Whether you’re getting a new garage door installation, repairing your beloved garage door, or need your garage door springs repaired, it’s going to be a pricey decision. Sometimes you even have to decide on the more affordable option so you don’t have to give up anything. With our coupons, you won’t have to worry about giving up anything when it comes to your garage door. Instead, you’ll be able to afford the residential garage door service you need without sacrificing anything. We offer an array of coupons for your garage door that’ll save you money and leave you smiling ear-to-ear at our work. What Coupons Do We Offer? It’s within your best interest to save money where you can, which is why our garage door company put together some helpful coupons to allow you to take advantage of the services we offer. We offer coupons that are 10 percent off all the way to $25 off. We know that many times our garage doors break because they are too old or because they just weren’t made to last. When you are searching for a reliable residential garage door company, contact us to learn more about what our garage door services can offer your home. We offer the garage door installation coupon so you’re able to get a new garage door without needing to spend a lot of money. Even if you don’t like the look of your garage door anymore because you had your home redone, you want some pizzazz added to the exterior of your house, or you can sense that your garage door is going to need to be repaired soon, this coupon is good for one household and has a $100 value. 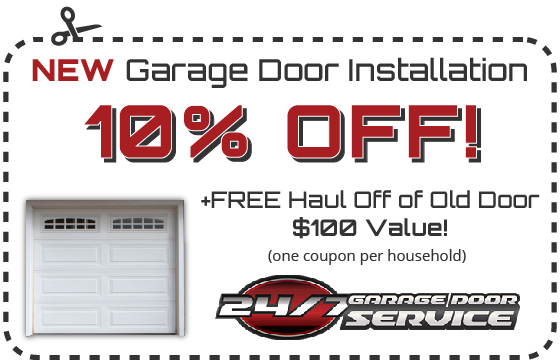 That’s $100 that you save when you pick 24/7 Garage Door Service. Another coupon we offer is the garage door spring repair. We know that sometimes those pesky little springs pop right off your garage door. Now, with this great coupon, you’re able to get new springs on your garage door without needing to spend too much money or look for a garage door installation. 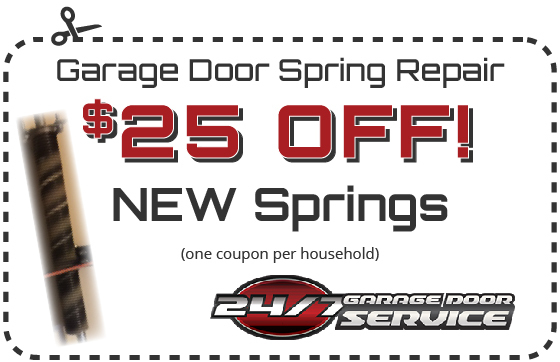 With $25 off, you’ll be able to save money on your garage door springs. With our third coupon, which is one of the best ways to avoid needing to purchase a whole new garage door, you’ll be able to hire us for preventative maintenance on your garage door. The best way to avoid any unnecessary breaks of your garage door is to get preventative checks on the door. By checking the nuts and bolts, lubricating the chain, and inspecting the cable, we’ll be able to help you figure out if anything is wrong with your garage door before it’s too late. 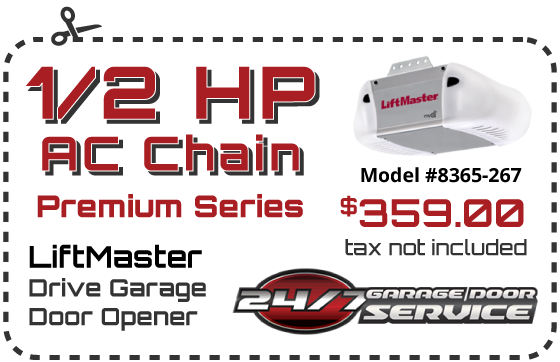 Our last coupon is geared toward your garage door opener. With the ability to help you get a deal on LiftMaster and other products in this premium series, you’ll have a brand new garage door opener. You can save money when you pick our garage door company. 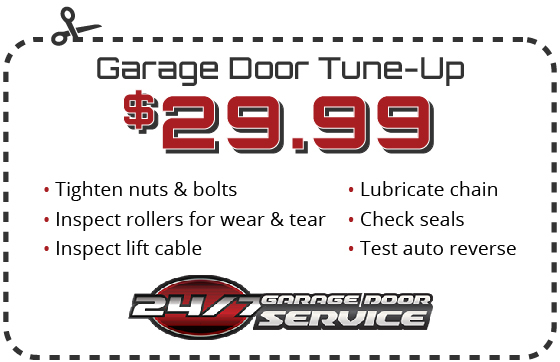 All you need to do is pick one of these coupons when you need a garage door service that matches up.